I thought it was about time that I made something for my little man seeing how everything I have been doing lately is for the girl’s or a custom order. 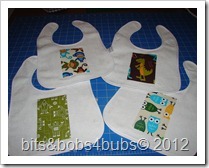 So when I reached for a bib this morning and realised that they were all getting to small for Ethan I remembered that I picked up some plain bibs at the Charity shop sometime ago but had’n’t made up my mind what I was going to do with them. They are brand new and I got 4 for $2, bargin. 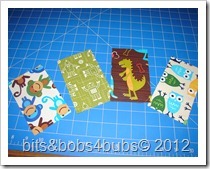 I hunted through my fabric scraps and found 4 fun boy prints to use. 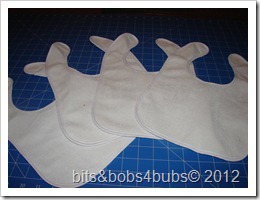 Now to just cut out and add Heat n Seal adhesive to the fabric and then stick it to the bibs. 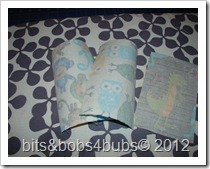 I always stuff up with adhesive and iron the wrong side on first. 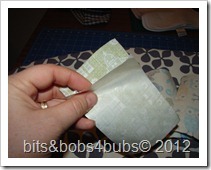 Must remember ‘place adhesive on wrong side of fabric with the paper side up’ lol. 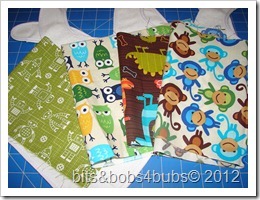 Finally a zigzag stitch for decoration and here you have it, 4 new bibs. Now to wait till he wakes up to use one. These are so cute! 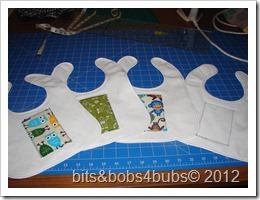 Applique makes things so much more fun. I'm your newest follower! I would love for you to link it up to my link party. I know my readers would love it too! these are so cute! thanks for sharing. have a fab weekend!